Windstar Cruises announced today that its owner, Xanterra Parks & Resorts, has reached an agreement with Seabourn, a cruise company that operates six luxury cruise ships, to purchase three of their ships: Seabourn Pride, Seabourn Legend, and Seabourn Spirit. Under the project name Global Windstar, the expansion will double the size of Windstar’s recently renovated, three luxury sailing yacht fleet, making the company the market leader in small-ship cruising with 300 or fewer passengers, with a total of 1,230 berths. The purchase on February 15, 2013, is one of several recent Xanterra Parks & Resorts acquisitions, including VBT, an adventure travel company, and The Grand Hotel in Tusayan, AZ, adjoining the South Rim of the Grand Canyon. “Windstar Cruises has experienced four straight years of revenue growth. This expansion is the perfect way to build on the momentum following our recent fleet-wide renovation, providing us with the much needed capacity to match the accelerating demand for our intimate style of yacht cruising,” said Andy Todd, chief executive officer of Xanterra Parks & Resorts, owner of Windstar Cruises. The delivery of the three 104 all-suite ships, which hold 208 passengers each, will take place over the next two years in the Mediterranean. 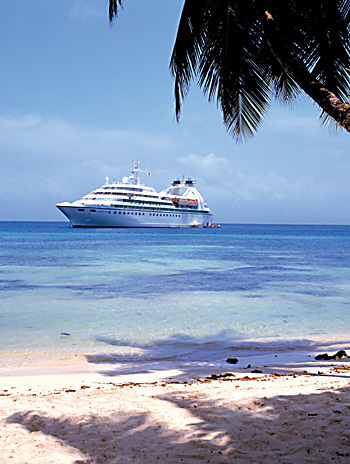 The Seabourn Pride will be the first ship to enter into Windstar’s luxury fleet in April of 2014. Following a Windstar branded renovation, which will give the ship a new name and casually elegant look, the Pride with set sail a month later in May 2014; voyages are expected to go on sale in May of this year. Windstar Cruises will take possession of Seabourn Legend in April 2015 and Seabourn Spirit in May 2015. These two yachts are scheduled to start sailing in May of 2015 following their dry-dock period. “Windstar is proud of its heritage in sailing, but what our guests are most enthusiastic about is our intimate, yacht style of cruising. This style is the core of our brand experience and the new ships are a perfect fit to build on that foundation,” added Hans Birkholz, chief executive officer of Windstar Cruises. The fleet expansion will provide Windstar Cruises access to new destinations such as Asia and South America, in addition to the fifty countries the company already sails to. Known for visiting hidden harbours and secluded coves of the world, Windstar will continue to focus on the unique destinations that large ships cannot call on. The opportunities of Global Windstar are already evident with the recent announcement of Windstar’s return to Tahiti in May of 2014. Tahiti has been one of the top destinations requested by Windstar guests and travel partners.